“Speak to all the congregation of the people and say to them: You shall be holy, for I the Lord your God am holy.” Okay: You shall be holy, for the Lord your God is holy. Isn’t that just what you wanted to hear today? I’m not sure Moses made a lot of friends with that line. No more than Jesus got a lot of applause in the Sermon on the Mount when he said Be perfect, therefore, as your heavenly Father is perfect. Leviticus is one of those books of the bible we all love to hate—too many words like “abomination.” Too many rules. But this verse, in particular, probably makes lots of us itch. To the extent that our culture engages religion at all, it is a cultural norm to think of holy as that which is set apart, that which is more sacred than we are (holier than thou). Deep down, I think many of us feel that we are not supposed to be holy, only God is holy. Or maybe, only God and people like the Dalai Lama and a bunch of anonymous monks and nuns. And yet, here is Godself telling Moses to tell everyone: you shall be holy. Not just you who serve the church full-time or who have taken monastic vows. You, and you, and you. The wonderful thing about this reading, though, which is also true about all of our readings for today is that they give us concrete images of what it means to be holy. The portion of Leviticus that we read this morning is part of a larger section of the book called the Holiness Code. 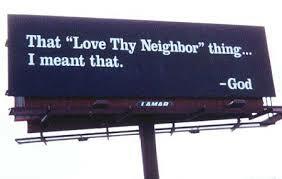 It is all about the practical, ethical behavior with which we live out the commandment to love our neighbor. Holiness is inextricably linked to love, and our readings remind us that love is a verb. How we feel is irrelevant in our striving to be faithful, whether we are being faithful to a loved one or to God. This holiness code is about what I call everyday holiness. That kind of clarity works for disciples like me. You shall be holy, for I the Lord your God am holy. Psalm 119 does not give us the same concrete images for everyday holiness, but it’s pretty clear, too. When was the last time you read Psalm 119 from start to finish? It’s got 176 verses. We rarely read it on Sundays; the Daily Office lectionary feeds it to us about 18-20 verses at a time on Wednesdays. It’s form is what’s called an alphabetic acrostic; it’s verses are divided in to 22 8-verse sections, one for each letter of the Hebrew alphabet and, in Hebrew at least, each of the eight verses of that section begins with that letter of the alphabet. The most important thing about Psalm 119 is that practically every verse contains a synonym for the Law. Statutes, commandments, decrees, your ways, your promise, ordinances, precepts….Psalm 119 but points us straight back to Leviticus. What is God’s law? God’s law is to be holy as God is holy by practicing everyday holiness. So much for the warm fuzzy Jesus taking the place of that mean Old Testament God! Jesus is not overturning the Law, but extending it. When I first started looking at this Gospel, I had an image of the Kingdom of God filled with people joyfully walking an extra mile with no coats on, handing out food and money and blessings along the way. Turning the other cheek, responding to oppressive demands by doing even more than what is ordered of us turns oppression on its head. Suddenly, those who were squashed down are in charge. Jesus invites us into a new reality, a new way of engaging with the world around us. This includes the everyday holiness of loving our enemies and those who hurt us, loving them as much as God loves them. This really is what Jesus asks of us: be perfect, therefore, as your heavenly Father is perfect. The Good News is that perfection is less about getting things right and more about loving as God loves. Being perfect in this way is not a goal that is hopelessly out of reach; it is the invitation to be holy, every day. Everliving God, we humbly pray that, as your only-begotten Son was this day presented in the temple, so we may be presented to you with pure and clean hearts. Welcome to the east of the Purification of the Blessed Virgin, also known as The Feast of the Presentation of the Lord, also known as Candlemas. I had to check the pages in front of the Prayer Book titled “The Calendar of the Church Year” to remind myself, this past week, that this Feast of the Presentation is one of only three feasts in church calendar assigned particular dates that, when they fall on a Sunday, trump the regular readings for that Sunday. (I know you’re dying to know the other two such feasts. They are the Holy Name, on January 1, and the Transfiguration on August 6.) Hence this week we are skipping over the readings for the Fourth Sunday of Epiphany. In case you’re wondering, we’re missing the wonderful reading from Micah, about God requiring us to do justice, love kindness, and walk humbly. We’re also missing the Beatitudes. Come back in late January or early February 2017. According to Jewish law, the firstborn male child in a family belonged to God, and his parents had to “buy him back” 40 days after his birth, by bringing him to the temple and offering a sacrifice, such as a pair of turtledoves. Forty days was also thought to be the time when women were no longer “ritually unclean” from the messy experience of childbirth. Hence the name Purification of the Blessed Virgin Mary, which, if you believe in the literal virginity of Mary, is a bit of an oxymoron, but we won’t go there today. Mary and Joseph are faithful Jews, and this common practice is what grounds this story in the temple, where we encounter Simeon and Anna. It is from Simeon’s words, “a light for revelation to the Gentiles,” that the Feast of Candlemas developed. 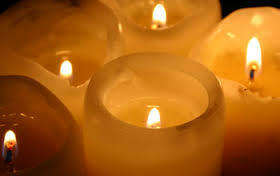 Candlemas began in the 11th Century with the blessing of candles to be used throughout the year in church and at home. Our altar guild is far too kind to complain about my excessive, but, mercifully, episodic, love of votive candles. Over the years I have purchased hundreds of glass votives and candles to fill them, for numerous occasions. Someday, someone will gift us with a traditional votive candle prayer stand to put in the back of the church—with a kneeler and an icon. Lighting candles has always been, for me, a tangible way to offer prayer. It is a way of saying God is here. God is always here, but when I light a candle, I perform the connective act of inviting God in. Light is, for many of us, a sign of hope. We talk about this time of year—Epiphany season—as the returning of the light. The days get longer, and the Epiphany star that guided the wise men to the baby Jesus shines a light on our own identities as followers of Jesus. The heroes of today’s gospel, in my book, are Simeon and Anna. Each of them shines a light onto particularly deep, patient, persistent faith. I could preach a whole sermon on each of them. Today it’s Simeon’s turn. Simeon’s gift to us, which has come down through the ages is his experience of peace, and the proximity of the Spirit, which combine into an ability to face death with grace. The other is his ability to lift up the tension embodied in Jesus. Most of us would not be as ready to go as Simeon is—his joy at recognizing the Messiah overcomes any fear of death he may have had. Surely, in real life, this moment of recognition is a mixed blessing. Put yourself in Simeon’s position: Yay! I’ve seen the Messiah. But, oh, that means it’s time to die.” How would you feel? The Song of Simeon has come down to us as the nunc dimittis, an offering in our evening prayer service at the end of every day. 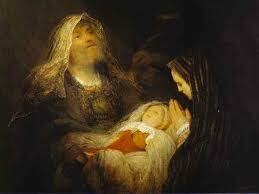 And I’ve prayed Simeon’s words at the bedside of many people close to death. I would venture to say that when we’re close to death, most of us want what Simeon has. We want peace and serenity at the time of death because most of us don’t have it. Most of us are not really ready to go any time. I had a friend in New York who flew to Europe on a regular basis. I went through a phase of being fairly fearful of flying and when I shared this with her she shrugged and said “I get on the red-eye, I close my eyes, and I figure when I wake up, I’m either going to see Paris or I’m going to see Jesus.” I always thought she must be far more spiritually mature than me. Certainly more like Simeon than most people. Simeon’s message, though, is not all sweetness and light, not all serenity and peace. And here is Simeon’s other gift, the ability to hold the tension of Jesus’ life and message. This child is destined for the falling and the rising of many in Israel…—and a sword will pierce your own soul, too, he says to Mary. Not all will be raised up by the good news of the messiah; for some, Jesus will be a stumbling block. For some, Jesus will be someone to reject and crucify. Simeon’s final words remind us that the earthly life of the little baby he holds in his arms will not end well, and that his mother, her own soul pierced, will—like any mother—have a share in her child’s rejection and pain. This Candlemas, this Feast of the Presentation, marks the end of Jesus’ birth story, the story which began with Luke’s gospel on Christmas Eve. In today’s gospel we hear the great both-and themes that began in Advent and that pervade the gospel: remember? (I talked a lot about “both-and” in Advent.) Repent and believe the good news. Rejoice in the coming of the savior, and change your hearts and minds to prepare for salvation. Jesus came to bring peace on earth, and Jesus came to bring judgment. Some will experience him as judge, and others will experience him as the bearer of light and the prince of peace. As C.S. Lewis said “his wrath and his love are the same.” My prayer for all of us as we continue our Epiphany journey is that we might, with Simeon, be able to lift up both: to lift up Jesus and celebrate his message of salvation, and also to hear the call—harsh at times, painful at times—to become more like him every day. Want to hear it again? Have a listen.